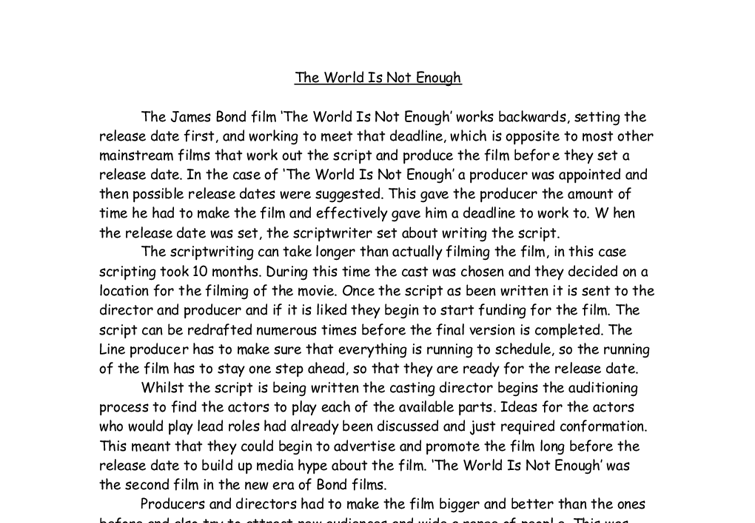 The World Is Not Enough The James Bond film 'The World Is Not Enough' works backwards, setting the release date first, and working to meet that deadline, which is opposite to most other mainstream films that work out the script and produce the film before they set a release date. In the case of 'The World Is Not Enough' a producer was appointed and then possible release dates were suggested. This gave the producer the amount of time he had to make the film and effectively gave him a deadline to work to. 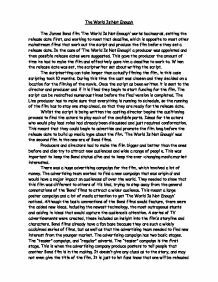 When the release date was set, the scriptwriter set about writing the script. The scriptwriting can take longer than actually filming the film, in this case scripting took 10 months. During this time the cast was chosen and they decided on a location for the filming of the movie. Once the script as been written it is sent to the director and producer and if it is liked they begin to start funding for the film. The script can be redrafted numerous times before the final version is completed. The Line producer has to make sure that everything is running to schedule, so the running of the film has to stay one step ahead, so that they are ready for the release date. ...read more. The "teaser" campaign, and "regular" adverts. The "teaser" campaign is the first stage. This is when the advertising company produce posters to tell people that another Bond film is in the making. It doesn't give any clues as to the story, and may not even give the title of the film. It is just to let fans know that one will be released shortly. The "regular" campaign is when serious promoting starts. This is "image adverts" for the cinema, short clips of film, showing who is starring, the title and release date for the film. Advertising increases as it builds closer to the release date. Another way, they use to promote the film, is by having a well-known singer sing the title music and release it as a single. This way, the news about the film will reach more people. The final week before the release date, the "rush" will start. Whilst the final touches are being made to the film, the actors/directors/producers are being interviewed and media hype is at a max. Once the footage is complete and the film is ready to screen, they will have the premiere and the critics will get to see the long awaited Bond Film. ...read more. Christmas Jones, but is met by Renard- his long term enemy. They have words, and scuffle. By the end of the scene, it has been full of explosions, gunshots, chase and the classic line; "What's your name?" "Bond.........James Bond" This scene is what you typically expect of a Bond film. It is packed full of action, Bond is just warming up. The plot in 'The World Is Not Enough' is that Electra King is continuing her father's business after he died. She has competition and tries to wipe them out. Bond is sent to protect her, as they think whoever killed her father is after her. In the end, Electra is working with Renard- both are the "baddies", and Bond ends up the hero and gets the girl- Christmas Jones at the end. Another scene where Bond demonstrates his traditionalism is when Bond is at a Cocktail Party. Bond is always mixing with the "high and mighty" millionaires, so he gets to go to the fancy black suit and tie dinners, even if it is purely for business. I used this scene as an example, because in every Bond film, Bond goes to a party and saves the guests from dying or gets to meet his enemy. Another of Bond's famous sayings is "Martini- shaken, not stirred". ...read more. * Returns Using the above methodology, Pepsi World shows how Pepsi is made to introduce the quality and features of classical cola (pepsi.com, 2004). At the same time, the website indicates that each ingredient of producing Pepsi-Cola must pass high standard, rigorous quality control tests and strict bottling procedures all over the world. The men of law enter the scene with a predetermined 'horizon of expectation'. Their historical experience of similar crimes means they look for a particular set of codes in this case signs of evidence, because this case does not fit into that experience they fail to discover the evidence. This is because now days people are generally use to the woman's body, but back then women where seen more formal and conservative. So what they have done in each of them is the opposite of what the public is use too and the 2007 film defiantly leaves more for the imagination. Finally a brief summary of the report is given outlining the main points presented and the recommendations that apply as a result. Introduction: Company Overview The Australian Jockey Club Established in 1842, the Australian Jockey Club (AJC) was the first thoroughbred racing club in Australia. Discus the revival of a new era magician chic.